British brothers William and Edward Douglas founded the Douglas Motorcycle company in Bristol in 1882. The firm was founded as a blacksmiths and iron foundry, producing their first motorcycle, a 2.75Hp flat twin, in 1907. The company won an army contract during WW1 and produced 25,000 machines for the use of dispatch riders on the worst terrain of the front. The above rare model is on display at Lakeland Motor Museum and features a horizontally opposed engine – also known as a flat twin or boxer, mounted longitudinally – in line with the length of the frame (See the two cylinder heads, one behind the front wheel and the other towards the back wheel). The Fore and Aft description is the nautical term for a boat with its sails in line with its keel, such as on a sloop or a schooner. Later motorcycles used this engine configuration but mounted transversely (across the frame). The design meant the motorcycle was longer than others with single cylinder, or v-twin engines, and is more suited to riding on straight roads than twisty ones. That said, Douglas had success in motorcycle racing, speedway and trials events – even securing wins at the Isle of Man TT races with various sporting models. 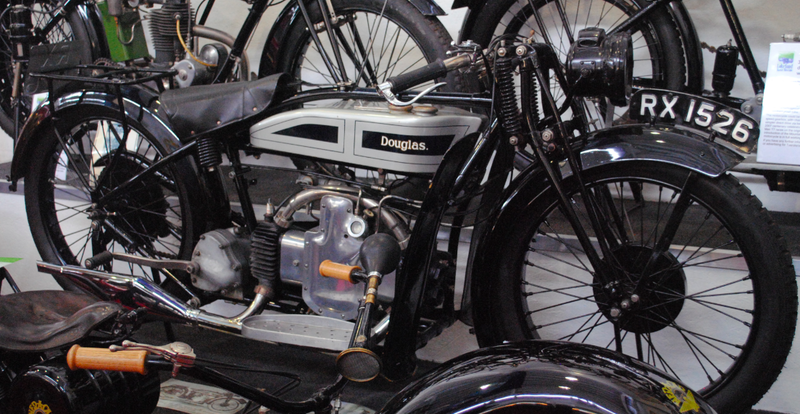 For almost three years, the Dirt Track Douglas was the supreme dirt track machine selling around 1200 in 1929 alone. In the 1920’s, Douglas built the first disc brakes and had a Royal Warrant for the supply of motorcycles to the Princes, Albert and Henry. Following bankruptcy in 1935, Douglas reappeared after WWII with a range of motorcycles that were far less successful than the Vespa scooter they imported and produced under license. The 1955 350cc Douglas Dragonfly was the last model produced by the company. Westinghouse Brake and Signal bought Douglas out and production of Douglas Motorcycles ended in 1957. Douglas continued to import Vespa scooters into the UK and later imported and assembled Gilera motorcycles.